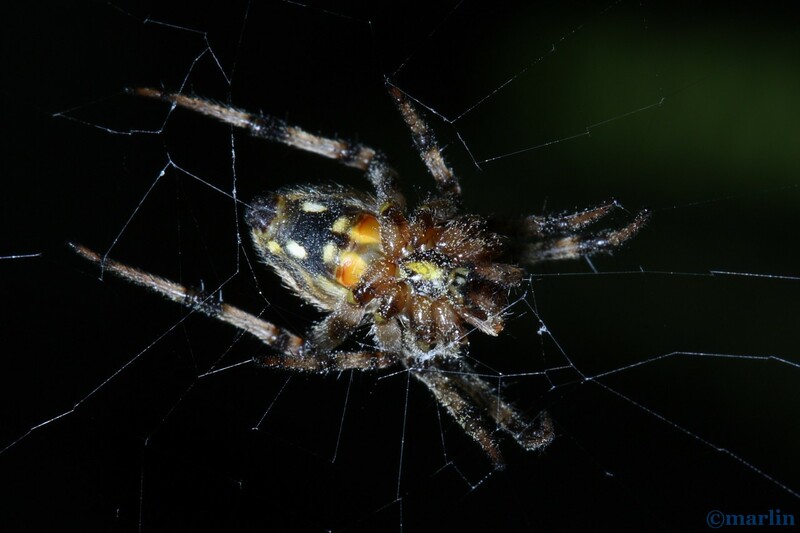 This gal is eating her old web during high winds just before a thunderstorm; she is supported by a single strand of brand-new silk issuing from her spinneret. If you’ve never seen one of these lovely spiders do this, it’s worth watching out for. It’s simply indescribable how she deconstructs the orb; all I know is she ends up with wads of silk she quickly devours. If you look closely at the picture above, you can see her claw gripping the silken strand. She accomplished the feat in just a few minutes, then retreated to her hiding place under a wooden stair rail to wait out the storm. These huge females are quite numerous where I live in northern Illinois. You can find them in foliage or building webs on your favorite porch railings. Those two white “eyeballs” on their ventral surface (below) is a dead giveaway. Be thankful they are eating your mosquitoes. N. arabesca female size = 12mm. 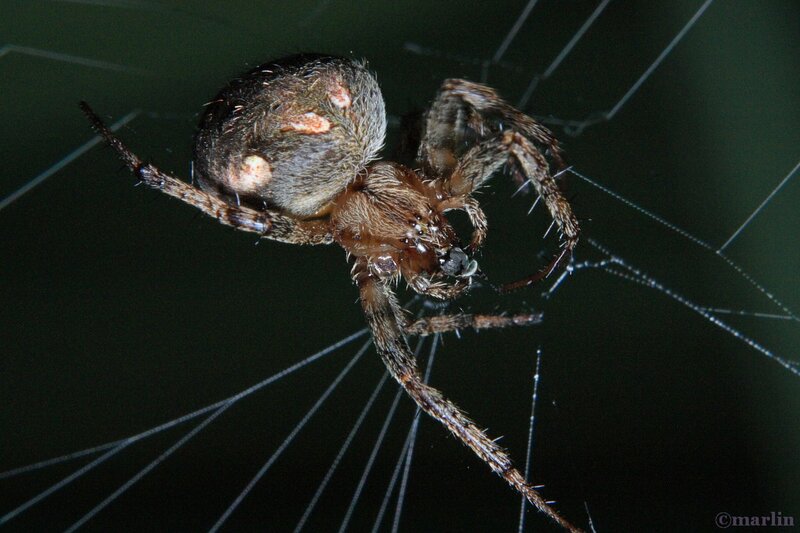 Many orb-weaving spiders routinely recycle their metabolically-costly silk in the morning or evening, according to the species’ nocturnal or diurnal habits. (Nocturnal spiders hide during the day, diurnal vice-versa.) This process may also serve to disencumber the web of insect carcasses which make the web more conspicuous and interfere with the vibration patterns the spider uses to distinguish the size and nature of her prey. In any event, a spider’s web is an exquisitely and intricately-wrought structure, evolved over millions of years of trial and error. The orb-web, in particular, could not be geometrically more efficient or practical. My hat’s off to these marvelous creatures! This male is happy to hang out in the flowers and see what happens by. I don’t know if he’s hunting bugs or not, but you have to admit his surroundings are rather pleasant. Imagine living in a flower you’re seeing with eight different eyeballs! 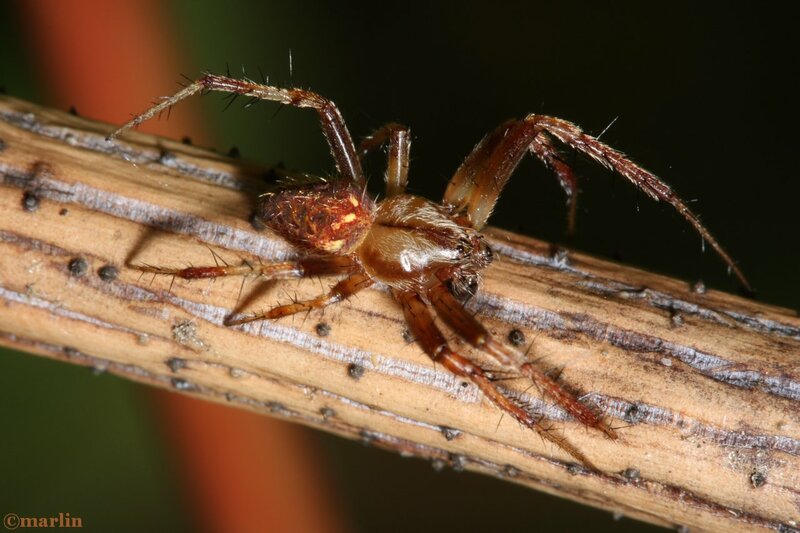 “Neoscona arabesca is a common orb-weaver spider found throughout the United States and Canada. 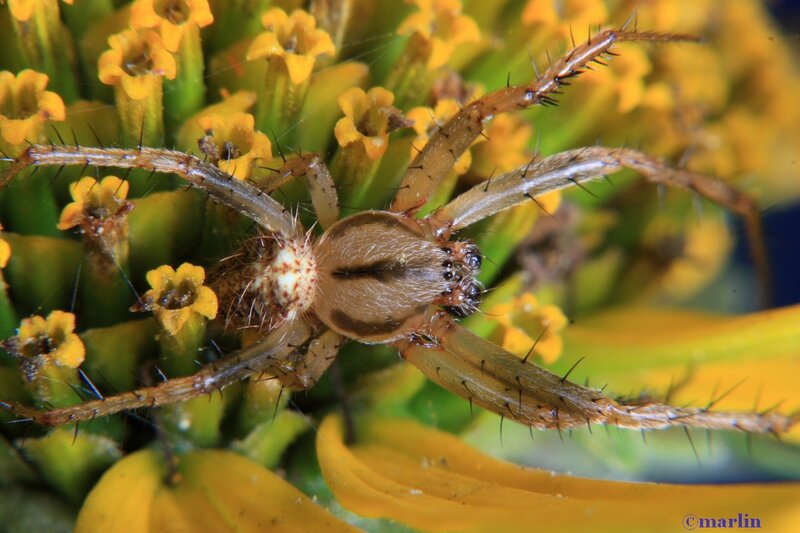 Often called the “arabesque orbweaver,” after the cryptic, brightly-colored, swirling markings on its prominent abdomen, this spider can be found in fields, forests, gardens, and on human structures. Neoscona species are among the most common and abundant orb weavers and are found on all continents . Berman, J. D., & Levi, H. W. (1971). 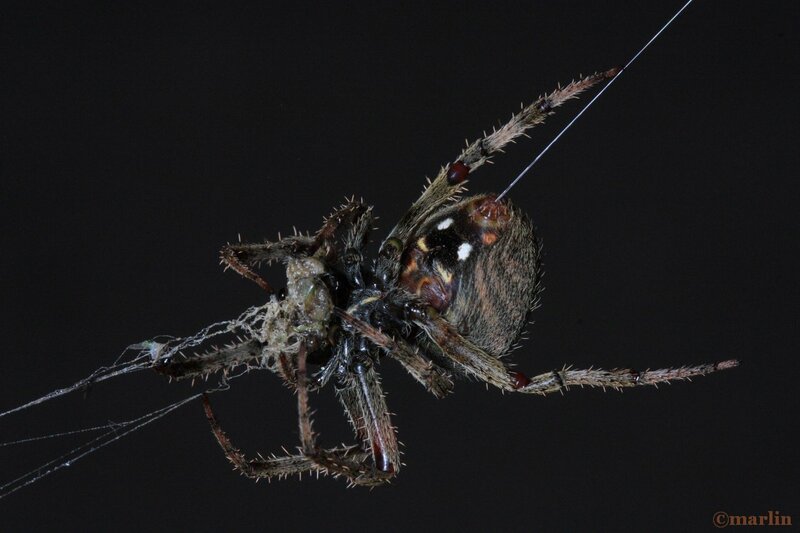 “The orb weaver genus Neoscona in North America” 141. Bulletin of the Museum of Comparative Zoology at Harvard College. pp. 465–500. Tree Encyclopedia / North American Insects & Spiders is dedicated to providing educational resources for our users through use of large images and macro photographs of flora and fauna in their natural habitat.